Our low prices have caused our inventory for this item to run low. You can still lock-in today’s sale price and order today. We will ship you the item as soon as our inventory increases, which should be on or after April 23, 2019. Just add it to your cart and proceed normally through the checkout process. 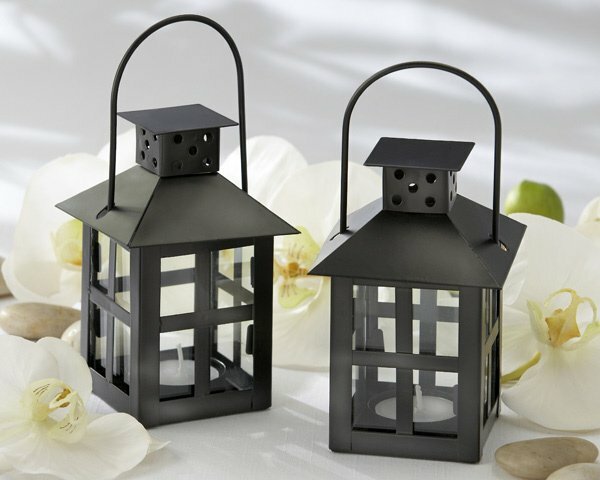 Light up your event tables or illuminate a walkway with our contemporary black mini-lanterns. Each decorative lantern is skillfully crafted from matte-black metal and glass to resemble an antique design. Lanterns were first used things such as beeswax, various oils and even nuts and cheese to fuel the flame. This mini-lantern does include a tea light candle. Lantern: 3"d x 3"w x 4.72"h without handle, 3"d x 3"w x 6.69"h with handle . Please note: the prices listed are for an individual lantern. Do you offer free shipping for large orders? I'm sorry we don't offer free shipping but you can check here the available coupon codes we have to get a discount. No they are not battery operated, you need to manually put a tea light candle inside and it's not included. do these lanterns come in a gold finish? Yes, you can find them by clicking here. They are out of stock until 11/10/18, though. How big is Luminous Black Mini-Lantern Tealight Holder? The Luminous Black Mini-Lantern Tealight Holder measures 3"d x 3"w x 4.72"h without handle, 3"d x 3"w x 6.69"h with handle.